Publications are free; however, please limit requests to one copy of each per organization. Click here for our book order form. This guide covers the planning, development, implementation and evaluation of a community-based group respite program for cognitively impaired persons and their caregivers. This user-friendly manual is a creative collection of 100 theme-based activities designed for social day programs and other groups settings. Each theme is based on a four-hour program that offers opportunities for organized and spontaneous interaction including socialization, exercise, fine motor activities, games and special projects. This how-to-guide outlines a successful, innovative social day program model that addresses the special needs of people with early memory loss (EML). This EML program emphasizes memory enhancement through cognitive stimulation, education and socialization. The manual provides a practical, step-by-step approach to planning and developing this supportive program. This publication, a collaboration of the National Association of Area Agencies on Aging (N4A) and the Brookdale Foundation, is intended to make the aging network across the nation aware of important and successful Relatives as Parents Programs (RAPPs) operated by Area Agencies on Aging. We hope this guidebook will encourage the replication of RAPP supportive services to relative caregivers by the many Area Agencies on Aging that serve older adults. Note, hard copies of this publication are not available; however, you may download the guidebook here. 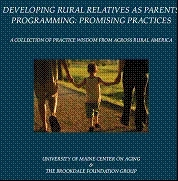 Developing Rural Relatives As Parents Programming: Promising Practices- A Collection of Practice Wisdom from Across Rural America was written by the University of Maine Center on Aging and funded by The Brookdale Foundation Group. The manual provides Relatives as Parents Programs (RAPPs) with a thorough review of the strengths, needs, and challenges of rural kinship caregivers, as well as practical tips on serving rural grandfamilies. The information in the manual is based on a combination of published research and extensive surveys and interviews with both service providers and kinship caregivers. Service providers offered input about the unique needs of their rural clients, barriers rural clients may face in accessing services, and strategies that they have used to help their clients. Kinship caregivers across the country offered insight as to what makes great programming for rural grandfamilies. The result of this effort is a collaborative and comprehensive manual showcasing many of the promising practices in use across the country. The complete publication is available for download at no charge by clicking here. Professionals in any field that work with grandparents raising grandchildren or other kinship caregivers are encouraged to utilize this manual to better support rural grandfamilies. For questions or more information on the manual, contact Jennifer Crittenden at jennifer.crittenden@umit.maine.edu or by phone at 207-262-7923. One million American children live in grandparent-headed households in which their parents are not present, effectively skipping a generation. These little-known families face unique challenges, highlighted in this new report. The information in GrandFacts: Data, Interpretation, and Implications For Caregivers, will be a vital tool for national, state and local policymakers, as well as agencies providing services to grandfamilies nationwide. This report points to the need to learn more about the caregivers and children in skipped generation grandfamilies. Most children are teens. Forty-two percent of the children are 12 to 17 years old. In parent-child families, only one-third of children are 12 to 17 (the rest fall evenly between two groups: ages six to 11, and younger than six). More children have physical and mental health needs than in parent-headed households. One-third of the children are in families with incomes below the poverty level. This is double the child poverty rate in parent-child families. Nearly half struggle with housing costs – renters as well as home owners. This is significantly more than is the case with parent-child families. Nearly one-third of grandparent householders have not completed high school. This compares to one-eighth of parents in parent-child families who do not have high school diplomas. These findings – which highlight the sub-group of skipped generation grandparents – came from the U.S. Census Bureau’s latest national sample, the 2005-2007 American Community Survey’s three-year estimates. The report was made possible with funding from the Annie E. Casey Foundation and the Brookdale Foundation Group. The complete publication is available for download at no charge by clicking here. An overview of the program established to meet the needs of persons with dementia and their caregivers. Includes information on the Brookdale Model, Community Collaborations, Participant Profiles, Partnerships and more. An overview of the program established to help meet the needs of grandparents and other relatives who have taken on the responsibility of parenting in the absence of biological parents.